I am not sure this is wanted.... I think its rather a bug ? When i have made an imageframe , positioned an image , in this case a pdf of a florplane inside, and i want to exchange it with new conted by drag and drop ! I'm not sure that drag and drop would "exchange content". Wouldn't it more likely just add a new layer on top of the original layer? What do you see in the Layers panel before/after the operation? I think the image frame is stil strage.... scaling the image and replacing it doesn't feel familliar to me .... maybe because I come from InDesign - this is my only point I really prefere the InDesign way. When scaling the palced image the frame itself isn't showen - that ist the most important point! I'd use "Replace image" on the context toolbar. Should keep the scaling, rotation etc. I don't think drag & drop would work. sure... that is what we could do, but its slower... when you allready positoned an image in a frame, it should be logical that you want to keep the size... its rather the usual workflow..
so publisher should understand that and enhance our workflow this way..
Again, Tom, I would expect a drag and drop to be adding a new object not replacing one. As MickRose suggested, Replace Image is the way to do what you're trying to do. If I draw a rectangle, I get a new layer in the document. If I drag a rectangle from another document and put it on top of that original rectangle, it does not replace it. I now have two rectangles, on two layers. For consistency images need to work the same. If I use "Replace image" the picture don"t keep the scalling, rotation, etc. that I used, it just put the picture at 100%. I don't find that relevant, because if I take the time to positioned the frame and the picture like I want, it's not to do it again if I change the picture. Maybe, it's because I use Indesign every day, but the drag/drop is the fastest way to do it. This is a forum to find out what the user think. I'm very use to the method InDesign dos it. There are amny things I relly prefer in AP but the way InDesign handles image frames, scale and replacement (accourding to scale) is much more effective to me. But I really like the "place image bar"
You are right, when you talk about simple images. But my company, is in architectural competitions all over the world, producing brochures with images alongside with floorplans, sections, side plans and so on. here , all the time, plans get positiond and scalled in a special way, and so exchanging them with new pdfs, vector based plans means changing only the content and not the size..
it realy makes sens, also to drop a new pdf on an existing imageframe with content. and here leaving the scale the way it was makes just sens and is totaly useful.. I think it's a great idea to be able to change the image of a Picture Frame simply by drag & drop. I used a lot of different photo book creation software and actually it's quite common there that you can change the image of a picture frame simply by drag & drop rather than an "Replace Image" button. This is one of the points where the Publisher definetely feels cumbersome and non-intuitive. I does many things right compared to the competitors but sometimes fails on low hanging fruits like this. all the time, plans get positiond and scalled in a special way, and so exchanging them with new pdfs, vector based plans means changing only the content and not the size.. I realize that this work flow may not work for you but here goes. I made a couple of documents in Affinity Designer "A doc" & "B doc" I made a document in Affinity Publisher and put in a picture frame of the desired size. I exported A doc as a PDF and named it replace.pdf then I placed it (set to Linked Preferred) into the Publisher document's picture frame. I moved and rotated the picture frame and saved the document. I then used Designer to export B doc as a PDF and used the same name so as to overwrite the current PDF. Switching back to Publisher I had a notice that the placed pdf had been changed so I updated it and the sizing and rotation were honoured. I guess you would have to have a set of generic names like "plan 1" etc and keep track of them, it is up to you as to whether this method (overwriting the PDF) would be possible. Edit; Nothing crashed but the memory was used up by Spindump and slowed the whole machine down. This might be due to something else but I thought I should mention it. This was a very simple PDF, so test on something small. Call me stupid but to me the picture-frame is keeping its rotation and size with drag/drop a new image. How did you do that? Picture Frame does not respond to dragging in a Image in my System. Also win10 and current Beta. Add PF>change the PF properties (*) to your liking>Open explorer or whatever you are using and drag/drop,with the move tool, an image on the selected PF. Now rotate your PF,not the image inside the PF but the whole PF. 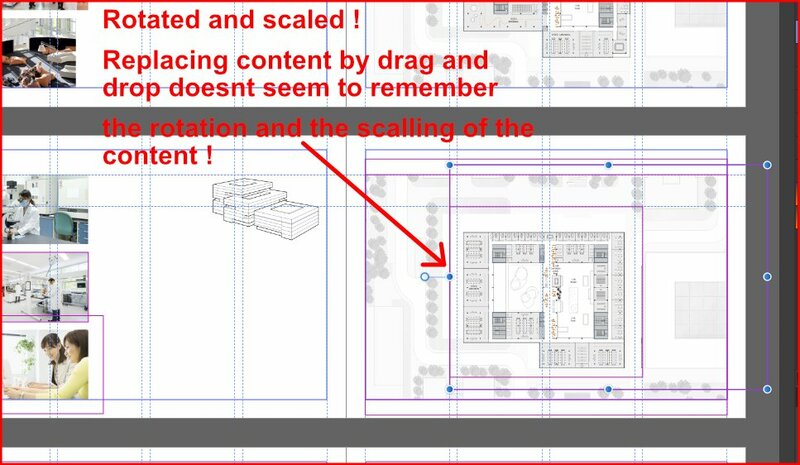 *The best property setting is "scale to maximum fit"
Interesting that this works, but dragging an existing Image Layer does not. This is incosistent. Thank you for the video. I now see where our misunderstanding is. You drag from an explorer window. If you first drag the picture into the document elsewhere it becomes a layer of type "Image". and offer me to put that Image Layer into the Picture frame. So as if I would do it in the assets layer. If you drag there a picture onto a frame it goes into the frame. The other way round a picture frame dropped on an image wraps it. The relevant cursor point in this cases is the top left corner. I like this behaviour and are kind of used to that. Enough to expect it. But maybe devs did not make that work intentional. Only they now. Maybe QA can give a statement to that. Now I understand what you'te looking for. this can be done in the layerspanel but not on the canvas. Yes, thanks for finding the right words to describe it. I struggle sometimes with that. I expect to be able to do that on the canvas. Either it's just a missing feature (because devs did not think about that) or it's missing intentional. Not sure about that and why. I figured that out, yes. But it's still cumbersome. In a WYSIWYG editor like this and compared to many other photo book software, which is essential a light version of a publishing tool it's intuitive to do as much as you can on the canvas. I strongly believe that those software works with layers to behind the scenes, but since everything can be done very intuitive on the canvas itself, there is no need to display a layer panel. For a professional publishing software I would expect both ways to function. There is no need for a professional software to be cumbersome that as Affinity Publisher when it can be intuitive and easy to use instead. Of course, Scribus is way worse. And you should take into a account that I come from propritary photo book software and Photoshop Elements. So I'm new to publishing tools and have a somewhat fresh view on that. I know from myself how that view gets lost over the time if you see the same behaviour over and over again and getting slowly used to it. It's just another way of handling things,some are like in other programs and some aren't that obvious. There are probably things to be expected to change because this is just a pre-release beta.